If you really like snakes or want to let out your inner "Slytherin" out, then this is the pendant you've been waiting for! 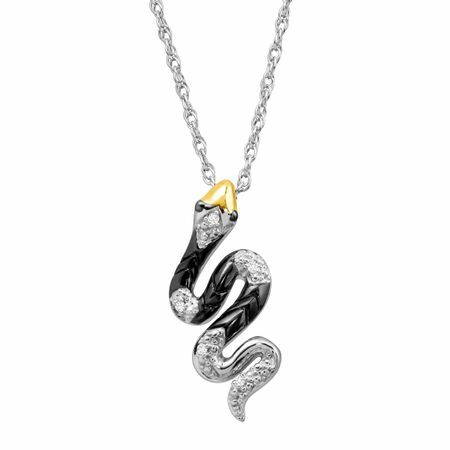 Features a sterling silver snake with round-cut white diamonds accenting every curve, completed with an 18K gold plated head and black rhodium plating along the body. Makes a perfect accessory for your Halloween costume as well! Piece measures 13/16 by 3/8 inches. Comes with a sterling silver 18-inch rope chain with a spring ring clasp.